Originally uploaded by Marc Millon. Topsham, Devon April 29, 2005 Gerald Ridgeway (tel 01392 876167), an enterprising Topsham fisherman and friend, has taken a lease on the Exe riverbed downriver near Lympstone and has started raising Exe mussels, oysters and clams. Gerald's lease on the Exe is for quite a substantial stretch of foreshore. The clams will apparently take a couple of years to grow to edible size, but right now Gerald is harvesting a very tasty haul of mussels, purified once a week by UV light in a saline tank he's set up in his garage around the corner from us. So now every Thursday, Gerald cycles around with a bag of mussels - we have2 kg a week which costs us the princely sum of 2 pounds. They are incredibly good, very clean (only need a light scrub and debearding), very full in the shell, firm and big (but not too big), and really tasty. We all love them, mostly classically steamed in white wine and shallots à la mariniere. I also enjoy them cooked Ancona-style in a tomato sauce to serve over spaghetti; with Asian flavourings, lots of chilli and lemongrass; Belgium style moules frites (the fries served with mayo); mussels in a saffron risotto; moules farci (on the halfshell with garlic breadcrumbs and parsley). Mussels: I could eat them most days and never tire of them. But, but...I sense the beginnings of a mussel mutiny from Guy and Bella ("Thursday? Oh no, not mussels in white wine again...") and am anxious to nip it in the bud before it before it flowers into a full-blown protest that will ruin my mussel-eating days forever. So I asked some of my fellow Eat Words friends to suggest some alternative methods to ring the changes and keep the family happy. John and Mary Whiting commented on my enviable source of cheap local food.“Your mouth-watering post warms the cockles of my heart,” wrote John. “In a world in which the historic foods of peasants can typically be enjoyed only by the rich, I am increasingly interested in ingredients/recipes that can genuinely be afforded by the impecunious, and mussels continue to occupy an honored place in the repertoire.” And with that he shared with me a delicious looking recipe for mussels prepared Italian style in tomato and garlic. Erica Brown, from the South of France, suggested a number of preparations, though the one I liked best was steamed in a glug of pastis. Michael Raffael suggested a rarity that I had heard of but never actually tried: an eclade. This is apparently best done on a beach: you take the mussels and arrange them on a board in a sort of spiral pyramid, cover them with pine needles and bay leaves, and ignite. Once the fire has burned away, dust off any excess ash and simply feast with your fingers, the tide preferably lapping at your toes and chilling your bottle of two of Vin de Pays Charentais. So many suggestions, and all deliciously enticing. However, I couldn't resist Sue Style’s suggestion for mussels cooked in a Thai green curry sauce. Said Sue, “Picture those plump orange ovals from the Exe resting on black rice in a spicy sauce with some chopped coriander, served in deep white soup bowls - Kim won't be able to resist photographing them, and they taste dangerously good. Hope this will keep Guy and Bella on board for at least another week or so..."
1. Scrub the mussels well and pull out any beards. Put mussels in a large pan with shallot, ginger, lime zest and leaves, lemongrass and chilli. Cook over high heat until the shells open (about 3-5 minutes). 2. Remove from the heat, tip the mussels into a colander set over a large bowl; measure out 1 cup of cooking juices and strain it through a fine cloth (if there is more liquid, reduce to concentrate). 3. Mix the curry paste into the strained mussel juices and put it in a saucepan with the coconut milk. 4. Shell the mussels and set them aside. 5. Warm some soup bowls. 7. Heat the sauce gently, add the mussels and let them heat through for a couple of minutes. 8. 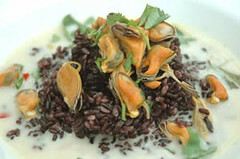 Divide the rice between heated soup bowls, sauce over, garnish with torn coriander and basil leaves.